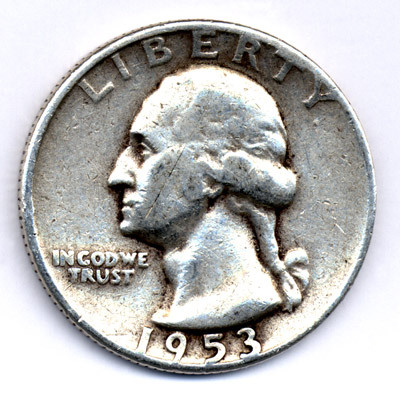 1953 quarter: When I was a kid, my mom would give us kids two quarters to buy a donut during the break between church and Bible class every Sunday. We always checked the date for that pre-1965 quarter, but never found it. Every since, I looked at all the quarters in my pocket change for that elusive quarter.That search finally ended on June 5th, 2001. I came across a quarter from 1953. I feel so proud.